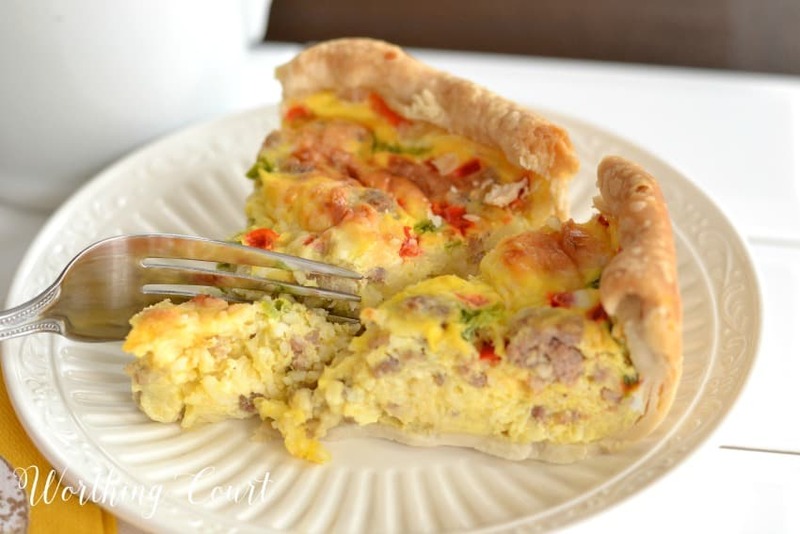 I’ve been making this breakfast pie casserole for years and it’s always a huge hit with friends and family! This is my go-to breakfast recipe when I want something more than just a bowl of cereal. The recipe makes two pies, so it’s perfect for feeding a crowd! If I don’t have a crowd to feed, I bake both pies, but freeze one of them for later. Leftovers can be refrigerated and popped into the microwave when you’re ready for another serving. I traditionally make this recipe for Christmas morning breakfast with my family. Since individual servings reheat so well in the microwave, everyone can just eat when they’re ready. I recommend covering what you’re reheating with a slightly damppaper towel. Sounds crazy, but that prevents the crust from drying out and becoming chewy. Your family will love you for making this yummy breakfast casserole! It can be frozen after baking or eaten right away. The recipe makes two pies, so it's great for feeding a crowd. Or freeze one after baking and enjoy the other as soon as it's ready. It reheats wonderfully, so make it over the weekend and pop a piece in the microwave each weekday morning for a nutritious, tummy filling breakfast. Place and arrange a pie shell in each pie dish. Set aside. Crumble sausage and cook until completely done. Drain cooked sausage on a paper towel. Allow the sausage to cool a little and mix with the shredded swiss cheese. Place half of the sausage and cheese mixture into the bottom of each pie shell and spread around evenly. Lightly beat all of the eggs. Combine remaining ingredients together and add to the beaten eggs. Pour half of the mixture into each shell, over the sausage. Do not stir. The sausage may float to the top. Bake at 375 degrees for 40 - 45 minutes, until firm in the middle of the pie. Can freeze after baking and warm in the microwave. If you’re attending a potluck brunch, I’ve got ya covered! Once baked, this breakfast casserole will travel well and can easily be reheated. If you’re going to reheat an entire casserole pie in the oven, I would slightly under-bake it, so that the eggs are still “wet”, but not runny. Then cover the casserole with a piece of tin foil and reheat at 350 F degrees until hot. I’ve tried lots of different breakfast casserole recipes, but none of them were as tasty and as perfect for preparing ahead and this one. Give it a try and let me know what you think! I am going to try the breakfast casserole, minus the crust. I have done this before and it works well and saves calories. 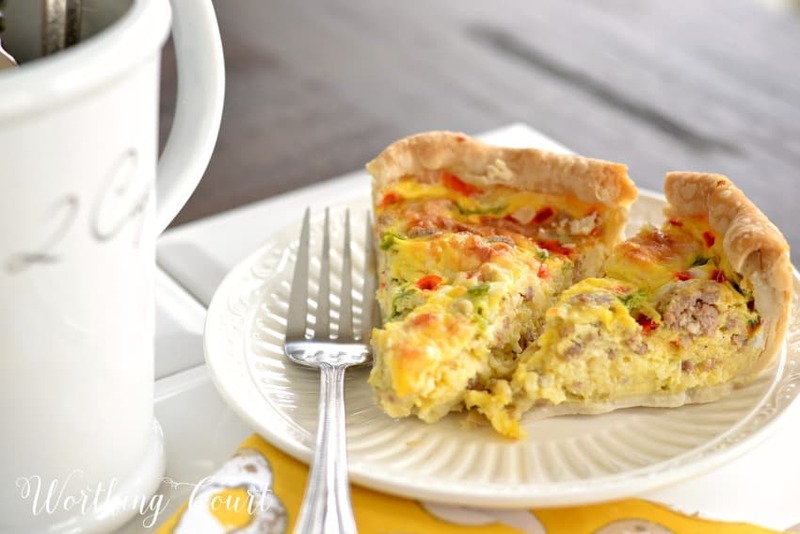 On another topic, I Love the “2Cups” mug next to your quiche. Do you recall where you found that darling mug?? Thank you, Suzy, for your excellent blog. I learn so much from you! This looks really yummy! I’ve been making a similiar quiche with bacon, broccoli and onion. Sausage and peppers would be a nice change! Thanks! I am always looking for make ahead breakfast ideas. During the summer months in Maine, we have lots of company and it’s a big help to have things made that only need to be reheated. I love a good quiche. This one looks scrumptious. I definitely will add this to my breakfast buffet on Christmas morning. Thanks for sharing, Suzy! Sounds like I should try this quiche over the holidays when the family is home. I like that you can freeze it and use it later. Thanks for the recipe. 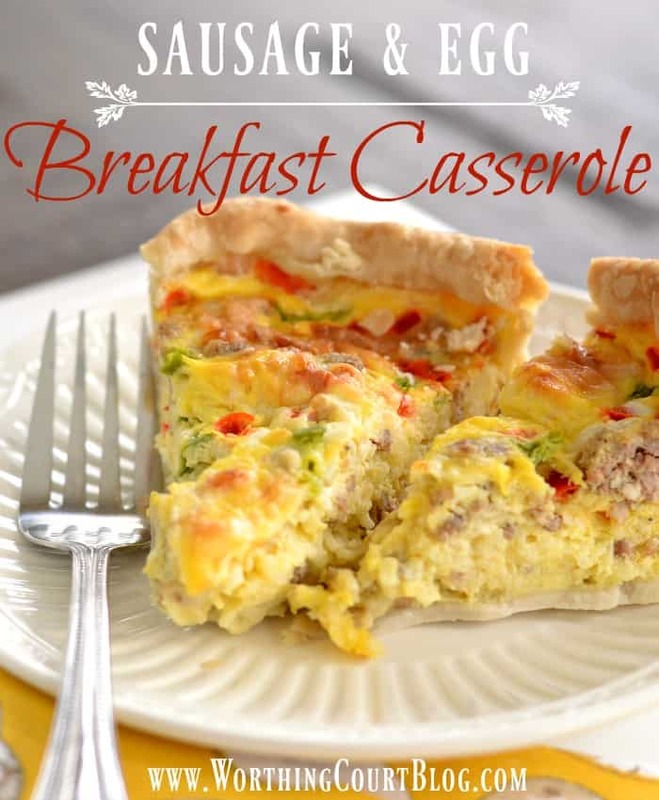 I love breakfast casseroles and this one looks like one my family will really enjoy, think I will give it a try this weekend. Thanks! This looks great Suzy!…I make a similar quiche/pie for special mornings of Holidays and guests…great to be able to make ahead…Merry Christmas to you, Pookie and your family!! I will definitely make this for a morning when my sons are home. I am always looking for a new breakfast casserole to serve to a crowd – 22 here on Christmas morning!!! This looks great! Looks quite tasty. I’m going to try it Christmas morning. That breakfast casserole looks really yummy. Thank you for sharing. Thanks for the recipe. I love making breakfast casseroles, especially for Christmas morning! Love the idea of a make ahead breakfast on Christmas morning !! Thanks Suzy!!!! This looks delicious! I may give it a try with my guys!! Looks yummy. Going to make this recipe this weekend. Thank you. Yum! I’m getting back on the low carb band wagon so I’ll try making this without the pie crust (even though I’d LOVE it). Thanks so much for the recipe! Can’t wait to make it…thanks for the recipe!! Looking for a new recipe for refreshments for a weekly church workshop, and this looks easy, quick, not very expensive! We rotate frequently, so I like to keep costs as reasonable as possible! Add a simple fruit salad and juice … YUM!!! That looks so delicious, Suzy! My kids ( they’re not kids anymore they’re almost 18) like it when I make Cinnamon Rolls for breakfast. It’s one of our traditions! 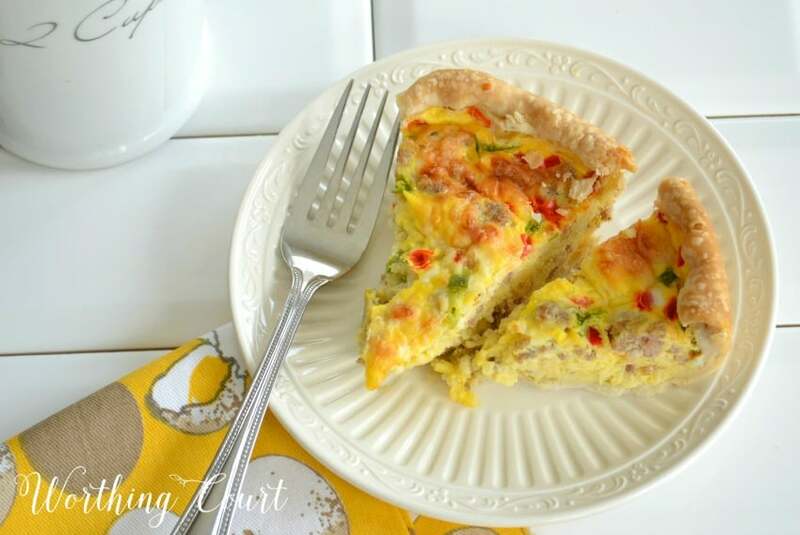 I do love quiche ,though, especially to make it ahead of time. Merry Christmas and thanks for sharing! Hope you have a wonderful Christmas I enjoy your blog immensely. God Bless you and your family Suzy. This breakfast casserole sounds yummy! Merry Christmas! This is perfect for company on Christmas morning! Thanks for this Great suggestion!